"Note: This review will contain gushing, gifs and lots of Caps locks. Read at your own risk!" This summer has been an amazing one for me when it comes to books. I decided to create my own summer challenge that consists of me reading all of those books that I've been dying to read but haven't. No review books allowed. This are strictly books of personal interest. Phew, now that I've gotten that out of the way, let's gush about this AWESOME book! 2 weeks have gone by since I read the last page of this marvelous book and I am already fighting the urge to re-read it. Peter Pan has always been one of my favourite stories. As I child, I was always fascinated with Neverland, the Lost Boys, Peter and everything else! I was a bit apprehensive going into this novel because I have read Peter Pan retellings in the past, and they never really won be over. However Tiger Lily delivered. It delivered BIG TIME! I've never considered Peter Pan "swoon-worthy". I always considered him as a boy. Not the case with this Peter though. I was majorly swooning! I guess I should just get in line right? Mermaids, Tinkerbell, Tiger Lily, Wendy...Tough competition! There is so much to discuss; Where to begin? 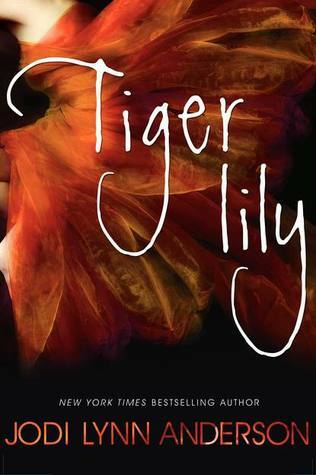 Tiger Lily was an enchanting character. I loved that we got to learn so much of her story, and that it was delivered beautifully throughout the whole novel. Another great aspect was that the book was narrated by Tinkerbell. With that being said, she doesn't have as strong of a presence as Tinkerbell in all of the other adaptations. She is more of the story teller. Peter's character was both adventurous and heart breaking. It was quite sad. I loved Anderson's version of Peter Pan. He was real. There were moments that really broke my heart and there were moments that we see the wonderful Peter we all fell in love with! I could go on forever, really! There is so much to talk about that this would be the never ending review...Like what I did there?